My cousin Michelle's boyfriend, Jon, has a car named URE (it's pronounced as "oore"). 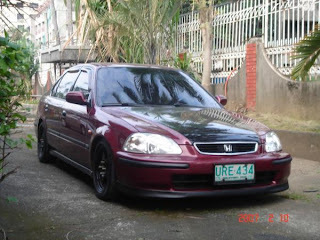 The name was from the car's plate number - URE 434. I met Ure on Michelle and Jon's first date (that was way back in year 2003 and I was in college back then). Wow! It felt like a decade ago! hahaha! Michelle was working as a DJ on an FM station in our province back then and Jon just migrated in Mindanao and was starting his bakery business there. Me and Michelle actually met Jon on one of my gigs. Michelle sang a couple of songs that time with the band while Jon was there watching our gig. He was a friend of our band guitarist and was waiting to get acquainted to Michelle that time. During the handshakes, I was already aware that Jon was attracted to my pretty cousin. And I wasn't wrong because after a few days, Michelle was already fussing about making me her chaperon on her first date with Jon. After a few weeks of courtship, they ended up together. It's been five years now and their relationship is getting stronger. During Jon's stay in Mindanao we actually formed a band named CHANNEL X. I was on vocals and Jon was the drummer. Michelle was of course always present on our gigs back then, supporting us. For everybody's information, of all the bands that I have been with before, Jon was the best drummer I ever worked with. While Jon was still in Mindanao, I get to ride on his baby - Ure. Yes! Just like any other man who owns a car, he treats Ure like his baby. Up until now, Ure was never replaced. Jon even made him even more handsome by accessorizing him and changing better parts of the car. I love it when I go out with them because I could get to ride on Ure. I wonder when Jon is going to buy Ure a GPS? So that him and Michelle won't have to fight over directions.